Current Market Analysis: The market for Ohio national bank notes is very weak right now. There is still reasonable demand if you have a truly unique note. However, second and third known blue seals are can sometimes sell for less than $1,500. The problem with the market is that Ohio had hundreds of national banks and the supply of notes is huge. Today the state is economically depressed and collectors just don’t have a lot of money to spend. So the supply of rare notes is high and the demand is especially low. Obviously that is a poor combination if you are trying to sell something for a lot of money. The great news is that if you are collector you can spend a little bit of money and get a lot of value in return. 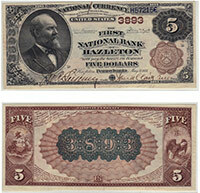 We buy all antique paper money issued by The First National Bank of Oberlin, OH. We can tell you how much your $5 bill is worth. We aren’t just dealers. We are also collectors, experts, and appraisers. We have contributed to numerous price guides and are considered specialists in the field of national currency. Contact us via phone or email to get your free appraisal today.